Croftlands Cottages are three family owned and run dog friendly cottages in Thornthwaite village. They are all fully equipped to a high standard and have wonderful views of Skiddaw. From the door are cycle tracks and miles of scenic walks, some on marked trails, winding through the forest out onto the mountains above. The cottages all have log burners (coal effect gas stove in Jasmine), patios, secure bike storage and private off road parking. The bedrooms are all en-suite (twin room in Jasmine has a shower and wash basin). A regular bus service runs through the village into Keswick. Squirrel cottage (sleeps 2) is characterful, romantic and cosy cottage, perfect for two at any time of the year. 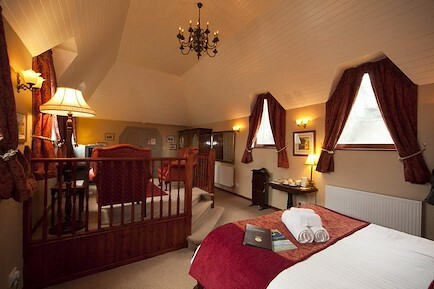 It has a king size oak four poster bed and a large corner bath. Downstairs is an open plan living/kitchen area (new kitchen Jan 2018) with an original exposed stone wall and beams. There is underfloor heating throughout and wooden flooring downstairs. Magnificent views. Fox Howe cottage (sleeps 4) is a delightful single storey ground floor cottage that may be suitable for anyone who has difficulty with stairs. There is a spacious open plan living and kitchen area, a double (king size bed) with en-suite shower room and a twin bedroom with en-suite bathroom. At the back is a dog secure flagged patio. Squirrel and Fox Howe are beside each other set back from the minor road that runs through Thornthwaite. Jasmine is a minute walk around the corner in the heart of the village just below Thornthwaite Gallery. Jasmine cottage (sleeps 4) is our new single storey ground floor cottage and like Fox Howe it may be suitable for guests who have difficulty with stairs. It has two bedrooms, a double and a twin, at either end of the cottage with an open plan dining/living /kitchen area in the centre. There are lovely outside seating areas at the font and back. Our cottages are located in the peaceful village of Thornthwaite. The village sits at the base and Whinlatter Forest Park and is 3 miles from Derwentwater and the market town of Keswick. Your enquiry will be sent directly to Croftlands Cottages. Please fill in as much detail as you can.